This week marks over half way through our growing season! We were hoping to have tomatoes to mark the half-way point. We have a few but not quite enough for CSA. Next week...will mark the beginning of tomatoes in your box! Although the days have been warm, sunny, and dry we are noticing the shift in the seasons with the shortening day length. We are hustling to ‘flip’ beds to make way for fall plantings. Last week our crew worked so hard, and we got so many transplants in the ground, plus we got the garlic out of the ground and curing. It’s taken me six years but I pretty much never get sore from field work anymore… nevertheless… my hamstrings are feeling it after pulling all those precious jewels of garlic out of our heavy clay soil. Pulling garlic is a hard job and this year we had one of our new field workers with Jay and me in the field, while the rest of the crew was busy completing the somewhat crazy amount of seeds we are starting for fall. We always feel thankful for all of our workers, and hustling to get all the garlic in (three of us pulled 2000 heads in 90 minutes!) served to cement my gratitude for our hard working crew. Every. Single. Member of our team could be earning so much more money at jobs that are so much less physically demanding. And yet they choose this work. This never ceases to amaze me--just as I am amazed by that tiny cabbage seed that can turn into that monster head of food in your CSA box. 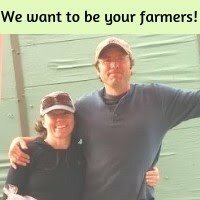 Our crew of talented, hardworking, creative, problem-solving farmers leaves Jay and me feeling incredibly thankful every. darn. day. Our fantastic field worker Sean just after pulling the last garlic. We are also including a larger amount of basil in the shares this week; enough for you to make pesto to top off your favorite dish. We took the tops off the carrots and the beets this week, as the tops had gotten big and aren’t the same quality for braising as the more tender young carrot and beet tops are. Also...those beet tops would have filled your whole box up! Some of the green cabbages got...pretty massive and we know many of you love our cabbage. Don’t be overwhelmed by the size. You can cut it in half or in quarters and the remaining amount of cabbage will keep well when wrapped in a plastic produce bag in the veggie crisper. We hope you enjoyed the very first of the cucs last week. This week we still have just a few but as they start to peak for the season more cucs will be joining the party in the CSA box. These little mini lettuces make beautiful salads and we love them chopped with some fresh onion and shredded carrot. Zucchini--Even if you don’t have the fancy veggie spiralizer, you can try your hand at “zoodles” with your vegetable peeler by peeling down the length of the zucchini, making long, wide ribbons as you work your way around. Stop when you get to the seeds, and cook the zoodles in a little bit of hot oil for 1-2 minutes. Top with some homemade pesto! Garlic, fresh, uncured--This can be used just like regular, cured garlic--crushed, minced, roasted, etc. You’ll notice the cloves are moister than cured garlic, and any unused cloves should be stored in an airtight container on the counter. Salad: Add all this to a large bowl. Dressing: Whisk well and toss well with veggies. Garnish options: Sprinkle on top if desired.